What Puts the “Smart” in “Smartphone”? I’m a couple weeks into my new Samsung Galaxy S4 which I bought as my iPhone 4S was slowly seeing its end. This seems to be a good time to weigh in on which phone is the really greatest! If we’re really being honest, the answer is going to be none of the above – or all of the above. 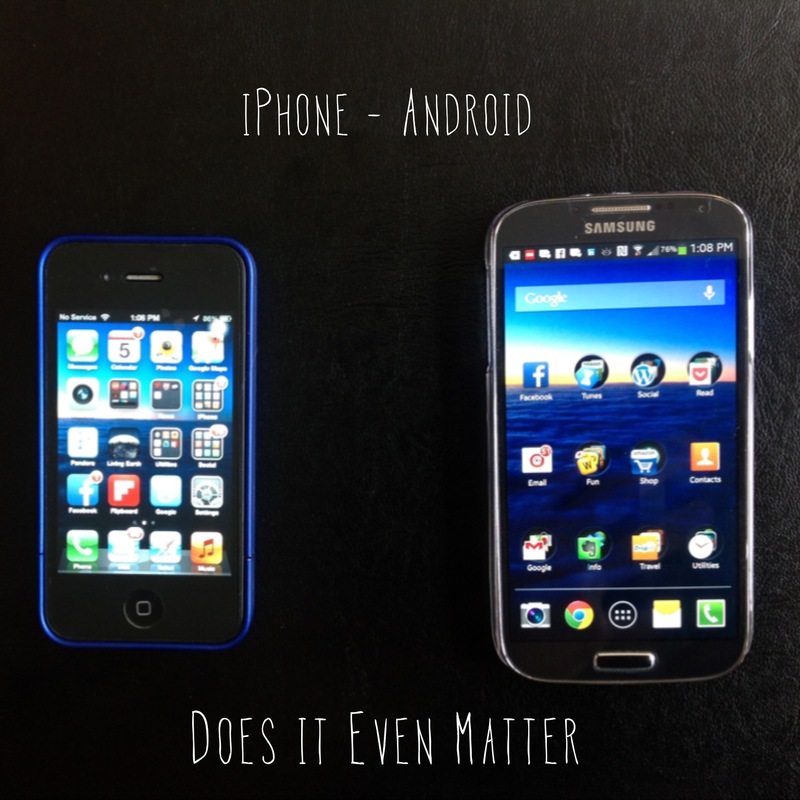 Android, Apple, Blackberry, and Windows are all struggling to beat each other out or cling to/gain relevance and it may actually be becoming less relevant to us as we ask one simple question: Where’s the “smart” in “smartphone”? Pick your form factor. What you want to do may not be on the phone anyway. Let me explain. I’ve had a couple iPhones and now an Android. What’s the first thing I did when powering them on after activation? I put in my Apple or Google IDs. Then I added my mail and contact accounts. Was it a little more seamless on the Galaxy? Sure, I have my personal info there. Did it make a difference? Nah, it all works and I can view all my email accounts and calendars together or individually. Next up? Content. I can get my music right onto my phone from iTunes or Amazon’s Cloud Player but I often just use Pandora anyway. Picture synch via iCloud to my Google account? No problem. Heck, the following step was setting up Dropbox which has an auto-uploader anyway. Evernote was simple. Facebook, Twitter, Google+, Instagram, Yelp, travel apps, Words With Friends? Bingo. Actually, I’d already begun using Google Now on my iPhone and iPad. Wordpress – no worries. Oh, I paired my Bluetooth earpiece the same way. Does it have an alarm? Puhlease. Are you getting the point? All of these services are becoming ubiquitous across devices. That’s a big part of how they add value to our lives. It’s easy enough to plug what we want into them. If there’s something that’s not worthwhile or easy, it gets dropped. A lot of the “smart” isn’t even in the phone. Sure there was a bit of a learning curve plus the desire to tweak out the user experience but it was no big deal. I’m pretty much as productive as I was on the iPhone after just a short time. I do enjoy that and the big screen is very nice along with a lot of the new features I’ve tried. What the devices are really becoming is an easy way to consume media and interact with content the way we want to. If you want a phone vs. phone outlook, I’d say that Apple’s got some rough time ahead in the short term. The rumors of a new iPhone 5S which is a marginally better 5 means that anyone clinging to a 4 or 4S may look around at other options. Apple’s reluctance to go 4G put them behind most other high end phones and the slowness to adopt bigger screens has done more damage. Their cool factor is turning into excuses for being laggards and losing their edge. My advice: continue to hedge your bets against lock-in to a platform and think about what you need and want out of a device. The price on the 5 just dropped so if you need a phone and have an older iPhone, why not go for it if you need a new phone. It’s just a portal into the cloud anyway. The thing is that absolutely none of the vendors are going to market their phones like this. They all want to stand out from the competition and be special. Samsung’s talking about all the cool camera, sharing, and gestures on the S4. Apple seems to be moving past apps and saying people listen to more music on the iPhone than anywhere else. Nobody’s saying: Get all the stuff you use and love on my platform because it’s easiest and offers the smoothest experience. That would really be a truth in advertising moment. Maybe what we’re seeing is convergence. Apple was out front for a while, but now others have caught up or even surpassed. It is difficult to stay in front. If innovation in smart phones plateaus, there may end up being little difference between them from a user perspective. Then marketing will be less about substantive differences and more about hype and brand loyalty–like Coke versus Pepsi. I think we’re pretty much there. Many people who started on Apple may not have experienced an Android or Windows phone. I hadn’t. This is a risky time for Apple. They’ve steadfastly been behind in network speed, screen size, NFC, and the openness of the UI. As a result, they’ve had to stand behind things like the App Store. Guess what… Pretty much everything is on Google Play now too. That leaves them clinging to their ecosystem while their competition tries to make them seem old. They need to figure a way out of that box. Of course, I took that picture with my iPad, annotated it using an app I got for free at a Starbucks, and am typing this on my MacBook Air. Apple’s far from dead or doomed!